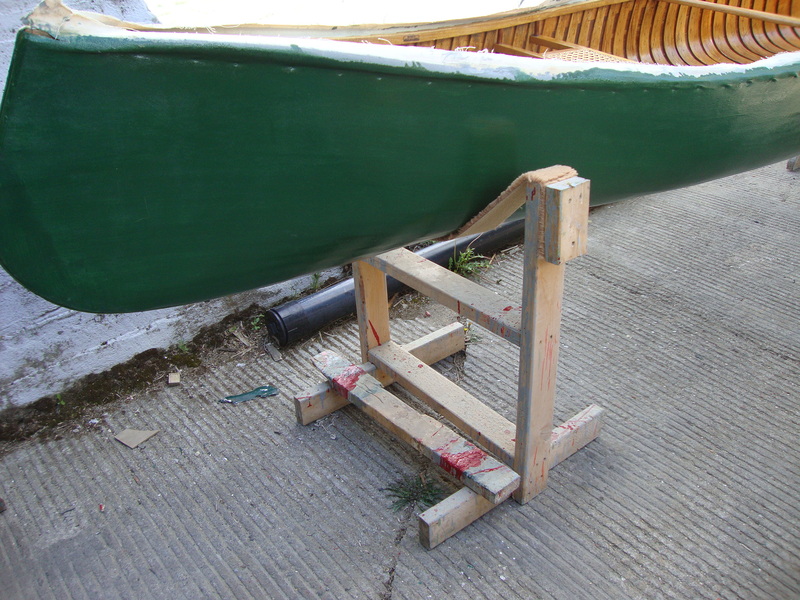 Once you’ve got your canoe out of the shed for the season, you’ll need some way of supporting it off the ground when it is not on the water. I can still hear my father saying, in no uncertain terms, “The bottom of this canoe touches two things: air and water”. One of the most convenient support systems is a pair of canoe cradles. They are quick and simple to build and can be stored easily when not in use. 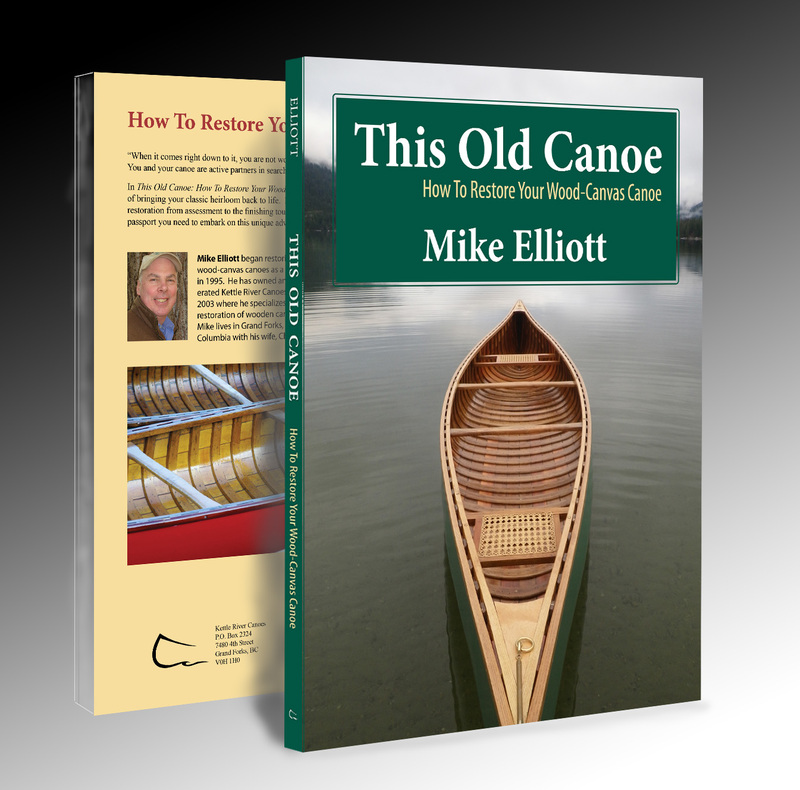 They are also essential tools when repairing or refurbishing your canoe. 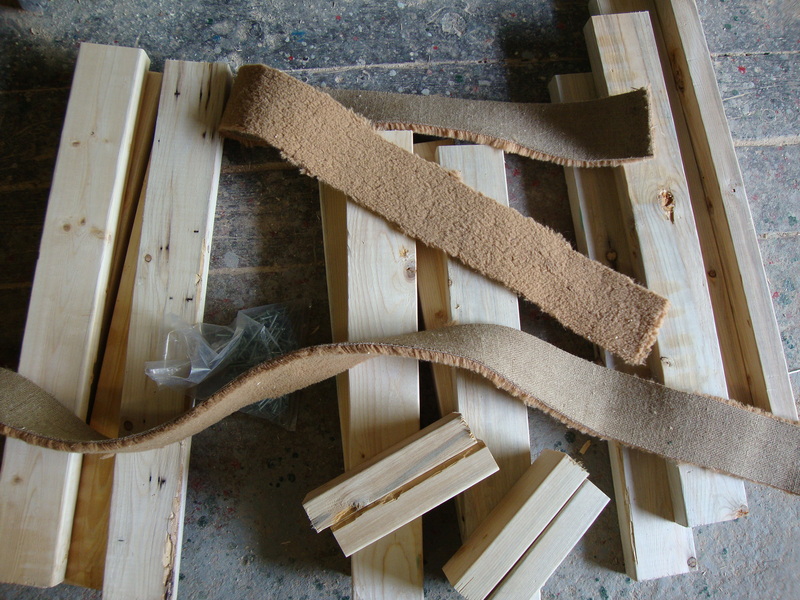 2 strips of material 3½” wide for the slings (I use pieces of carpet or scraps of canvas leftover from a canoe project). I have seen some people use 3/8” rope for the slings. 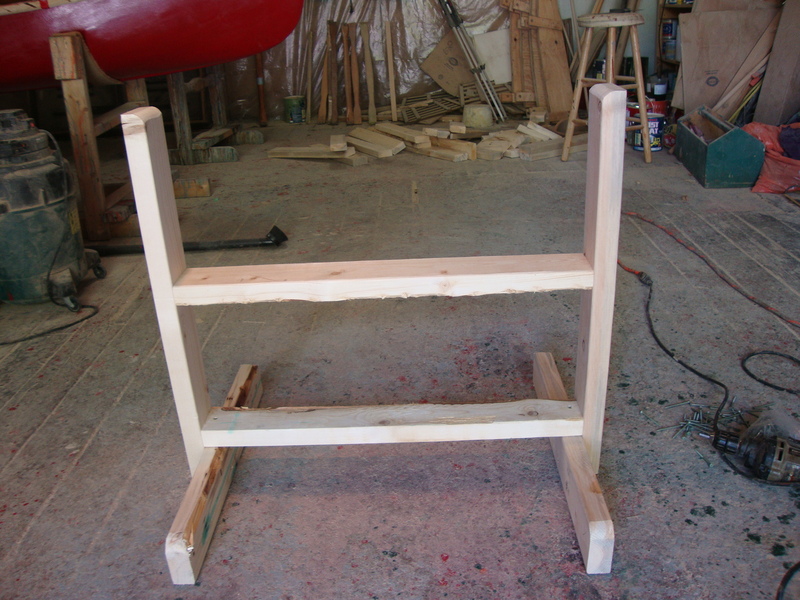 As far as dimensions are concerned, I find a stable design that still holds the canoe off the ground at a comfortable height have vertical and horizontal struts that are 28” long. 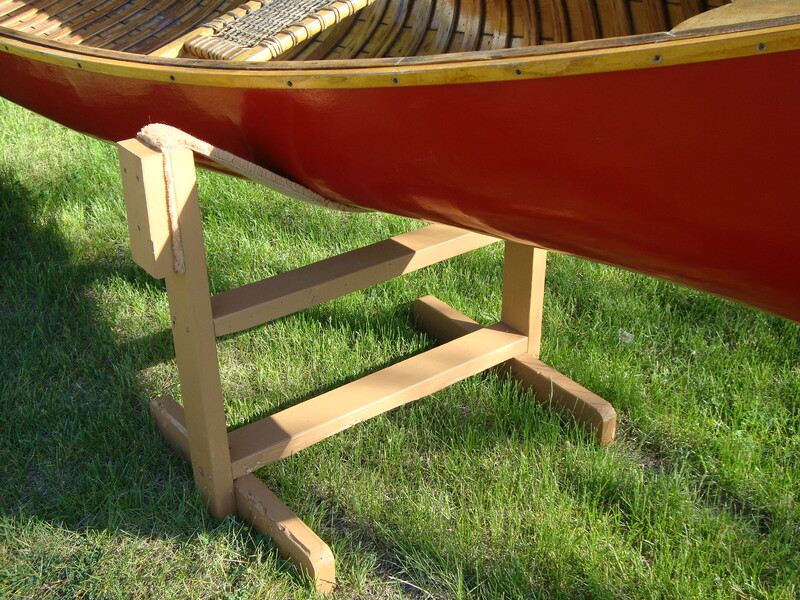 The base struts are 24” long and are oriented parallel to the centre-line of the canoe to create stable “feet” for the cradle. The sling material is about 50” long. 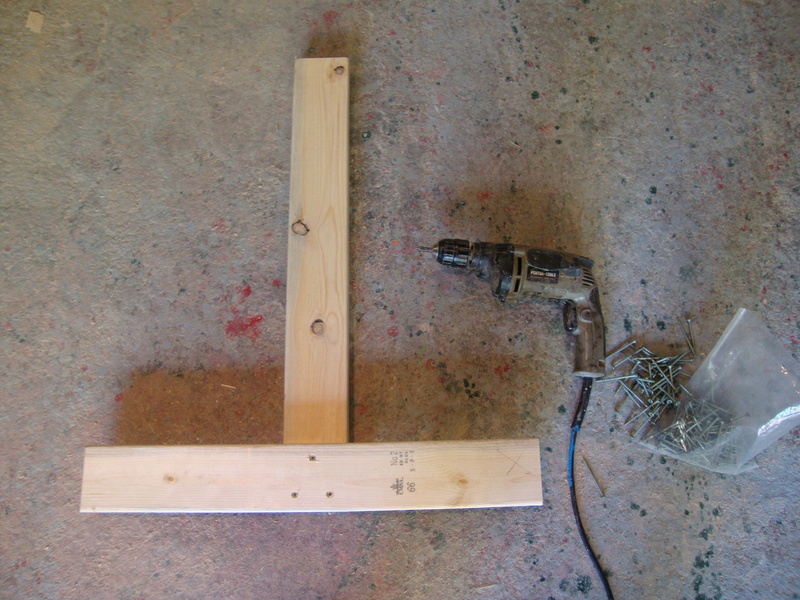 The clamps are just scrap pieces used to hold the sling material to the vertical struts. These can be about 6” long – whatever you end up with. To build a cradle, start by creating the two sides. They each consist of a base strut attached to the end of a vertical strut to form a T-shape. Next, the 28” bottom brace strut is attached between the two sides and the 28” upper brace strut is positioned somewhere in the middle of the vertical strut. 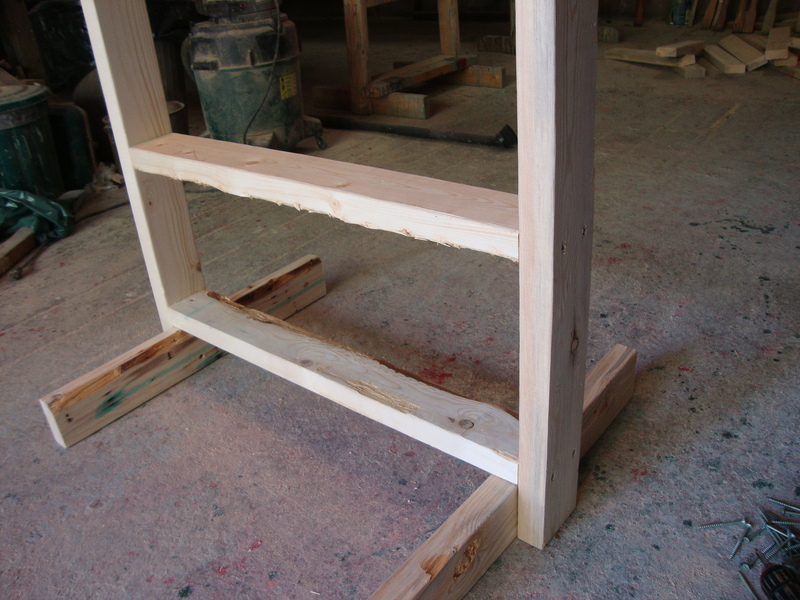 I take a minute to round-off the inside corners of the vertical struts. Otherwise, the sling material wears out quickly and has to be replaced frequently. I use an angle grinder to round the corners, but the same job can be done with a rasp and a little elbow-grease. Construction of the cradle is completed by attaching the sling by means of the clamps. 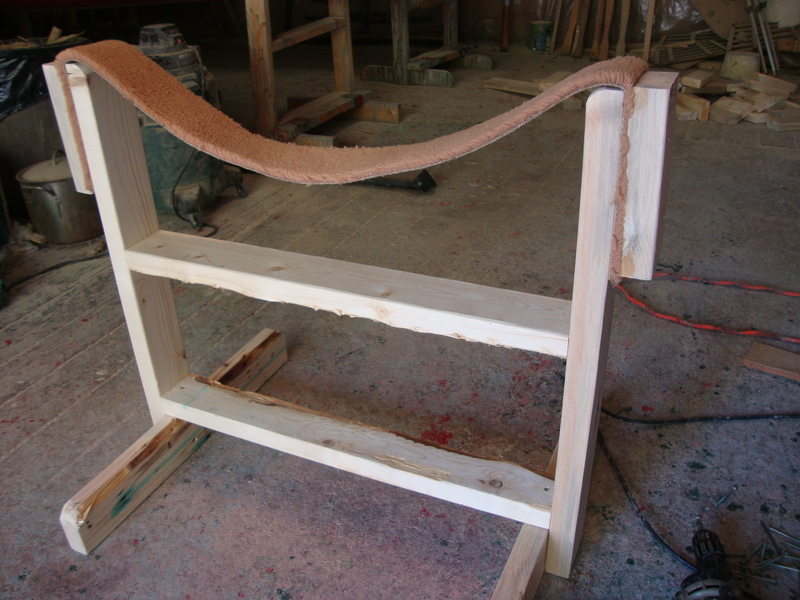 The whole process takes the better part of an hour for both cradles. If you want to pretty them up a bit, the struts can be rounded off and sanded smooth. Any cradles that are going to spend a lot of time outside are finished with an opaque oil-based stain to protect the wood. I happened to find a piece of 4″ wide trucker’s tie down webbing lying by the side of the road. It was perfect for cradles. I used treated lumber for mine and they have held up fine for three years now. I try to keep them in the shade to minimize UV damage to the webbing.